On 11th of September, Yamaha released a rhythm game on the iOS which features Vocaloid VY1. VocaloDama (ボカロダマ) is a game where you slide the Tama (sphere-shaped notes) across 7 pipes which will play out the tune of the song. 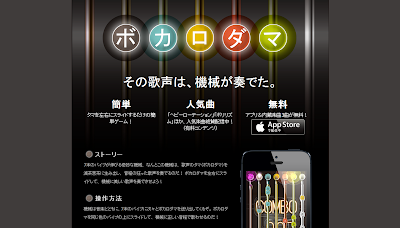 The app itself is free and only available in Japan. The songs however will need to be purchased at a pack of 3 songs for 300￥ each pack. Yamaha's Vocaloid, VY1 has been used as the vocalist for all the songs. Once you download the app, there will be 1 Vocaloid song ("Turkish March Song - Owata ＼(^o^)／ - Owata-P) included by default (A total of 3 default songs included in the app). iOS users might wanna check this out!